– The first row is group 1, the second row is group 2, etc. It’s easy to say Lilac is in group 3 (Lila in Column1, row 3). Omar is in group 4. You -can- group the hunter pets with the groups in grid.. but I don’t like the way that display looks. – Falt, Niho and Lilg have aggro (Red dot, upper left-hand corner) Since Lilg is a mage I bet it’s a bad thing that he has aggro. Since the tanks targeting skull (Joeb and Mich) -don’t- have aggro I’d guess that skull is currently chasing Lilg. Which now that I look deeper, is a really good guess. On the full screenshot Lilac (ME) is targeting Skull (right of grid). Skull is targeting Lilgnome. Though.. since Joebelcher has top aggro on omen (left-hand side) it’s probable that the skull is spitting poison at Lilgnome. – There are a couple of other people who are slightly hurt.. but it falls below my threshold. They might benefit from a tiny heal.. but probably, unless they have aggro, they’re fine as they are. (ie, Lilac has a tiny sliver taken out of her health.. she probably is just suffering a bit from the poison. Not worrisome at the moment). – There are three pets for the party. Kupl is Lilac’s(my) imp. He’s phase shifted (and altered to look out-of-range). Raks and Tyge are hunter pets. Tyge is targeting skull and Raks is hurt for about 2.3k. I don’t think mend pets show… I’ve never figured out if I wanted to add them. – It’s not shown here.. but on my healer, out-of-range toons show as more transparent. That way I don’t keep trying to throw heals on them. 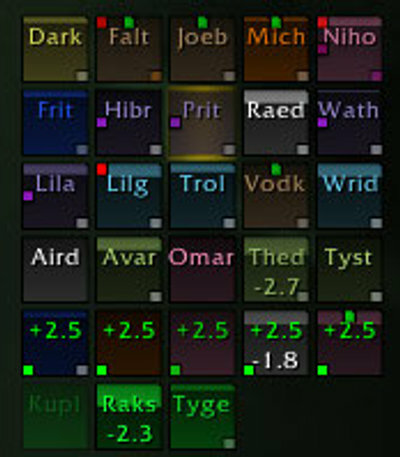 – You -can- configure Grid to show you other people’s mana bars. I haven’t found much use in that. Instead, if someone is low on mana (below 20%) Grid shows a pale blue dot on the bottom side. 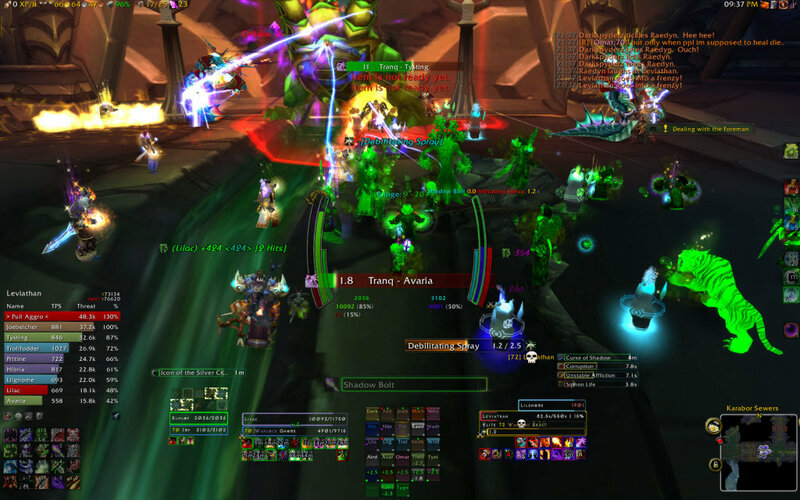 If I were tanking and needed to confirm healer mana before a pull I might configure it to show more detail. The thing I’ve found about grid.. is the more you use it.. the more uses you find for it. Clique. See full Grid+Clique post. So that’s what GridStatusRaidIcons does! Thanks, I’ll be adding that to my Grid setup tonight! You people and your evil colors. Bah!!! Not sure.. but it might let you use letters instead of colored dots. Heh…you must have posted this shortly after I started using Grid. I think I’ll have to grab a couple of those other add-ons for it! I’m working on it 🙂 I’ll try and get something uploaded this week.